I'll be part of the judges team for the 2010 Gala Maestro. Je ferai partie de l'équipe du jury pour le Gala Maestro 2010. From now, I'll invite you to visit my latest website: DAFARF. DAFARF has been created to broadcast short videos (as well as a few pictures once in a while). This new website will be updated more often. Still lots of kiteboarding but also other passions such as longboarding, surfing, snowboarding, skateboarding, wakeboarding, traveling, and much more! Je vous invite dorénavant à visiter mon nouveau site internet: DAFARF . DAFARF est entièrement consacré à la diffusion de nos petits vidéos (et de quelques photos de temps en temps). Ce nouveau site sera plus souvent mis à jour. Toujours beaucoup de kite, mais aussi d'autres passions tel le longboard, le surf, le snow, le skate, le wake, le voyage et bien d'autres! 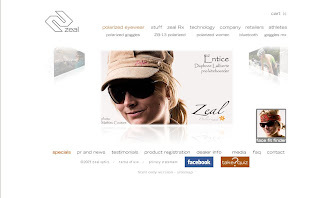 I'm presently on the opening page of Zeal Optics' website... as well as in other pages! 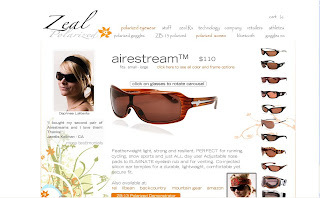 Upcoming Sports - Athlete of the Year & Maestro of the Year - Woman, AT GALA MAESTRO 2008! Thank you SO MUCH, because it's thanks to your votes, I won! I won the "Upcoming Sports, Athlete of the Year", but also the "Maestro of the year, woman"! This last categorie was for the feminine athlete who accumulated the most votes, all categories mixed up (Snowboard, Ski, Wakeboard, Skateboard, Upcoming Sports). I was really surprise, but also very happy and proud to give kiteboarding a place in this gala! Thank you to my sponsors one more time, NORTH KITEBOARDING, GOOCH, DAKINE, XCEL, ZEAL OPTICS. go vote for me! :: allez voter pour moi! P.S. To read the text, click on the image, it will open in a bigger size. P.S. Pour lire le texte, clickez sur l'image, elle ouvrira dans un plus grand format. 1:20, I was wearing a fluo green t-shirt and an helmet! 2:13, for a no-handed OHH! 3:43, for an other nice crash on the sand!! Once again... it wasn't really windy for the shippagan's windfest. Actually we knew the forecast wasn't looking great, but the weather on the acadian peninsula is always very difficult to predict... so we took a chance and decided to go anyway with a VERY optimistic thinking. It finally paid out for about 12 knots on and off on monday. The locals guys build a really nice slider before the new season started, but once again, I fell that very few people are motivated to move the slider and/or get something organize to manage a kite park in Shippagan. Anyway, I'm looking forward to go back and ride it! Here is a short video of "day 2" of the Triple S in which you can see me shortly... I'm the one with an helmet and an orange tank! I had lots of fun in Cape Hatteras last week. 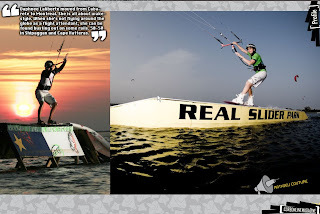 The REAL KITEBOARDING park is so cool and the weather was so nice, no wetsuit needed in the laguna! I've got lots of motivation watching the guys... Ruben, Alvaro, Aaron, Andre, Davey, etc. No pictures because Mathieu wasn't allowed to take pictures... yeah, we were so disapointed. I think it's because they had an exclusive agreement with an other photographer. Anyway, the organizers were cool with us, Mathieu should be able to shoot next year and they told us to come back whenever we want to ride and shoot on their park! 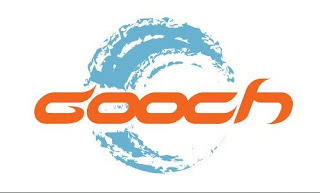 I am really happy to tell you that I am now riding for GOOCH! GOOCH is a great kite shop located by the Saint Louis lake in Pointe Claire (Montreal). 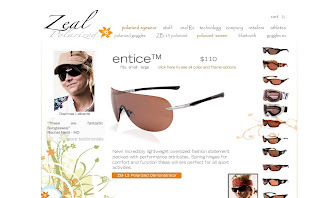 The are also offering a variety of clothes, wetsuits, etc. in their shop. Check out their live webcam for the current wind conditions on their website. I'll be riding the Vegas kites this summer and I will use the Paris board for freestyle and the Rocketfish for wave riding! For more infos about the NORTH KITEBOARDING gear,click here! Kiteboarding is a relatively new water sport. Also referred as flysurf or kitesurf, kiteboarding is in fact a mixture of the most interesting features taken from wakeboarding, windsurfing and surfing. The sport consists of using a kite to propel the rider and his board along the surface of the water. With this sport you can surf the waves, ride up wind, and jump while performing a variety of tricks. Kiteboarding is not limited to water activities. The same type of kite can be used to pull you along snow, ice, sand or on an asphalt surface. Only the board needs to be replaced. Le kiteboard est un sport nautique relativement nouveau. Aussi appelé flysurf et kitesurf, le kiteboard est en fait selon plusieurs un mélange des aspects les plus intéressants du wakeboard, de la planche à voile et du surf. Le sport consiste à utiliser des ailes à traction qui permettent aux kiteboarders de glisser sur la surface de l’eau à l’aide d’une planche. Ce sport permet donc aussi bien de surfer les vagues, de remonter au vent et de sauter tout en enchaînant des manœuvres. Mais les possibilités de ce sport ne s’arrêtent pas seulement là. Le même type d’aile peut permettre d’être tirer sur la neige, la glace, le sable et même l’asphalte en utilisant des planches adaptées à ces différents terrains.